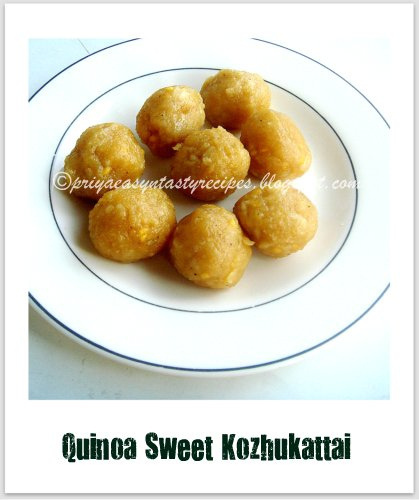 Wishing you all a Happy Ganesh Chathurthi, hope you guys are very much busy in preparing this wonderful festival with many delicious dishes, seriously am missing those days in India..Eventhough its working day here, we wont skip this festival at any cost as Ganesh is my favourite god...Coming to this sweet kozhukattais, i prepared them using quinoa and rice together eventhough i dont have any idea about the final result, but i was very much happy to see my creation turned out super prefect,addictive and highly delicious..Quite a healthy kozhukattais to offer as prasadam to Lord Ganesh...This sweet kozhukattais tastes and ressembles exactly like our usual kozhukattais, quinoa in this dumplings didnt changed the taste and turned this kozhukattais super prefect...I couldnt stopped myself having them,yep they are quite addictive..My teddies helped me to make these cute looking balls, i dont want to change their shape as my mini chefs helped a lot for making them, you can very well prepare them as pidi kozhukattais.. Grind the soaked rice,soaked quinoa with enough water as fine paste..take this grounded paste,jaggery syrup with oil in a non stick pan, cook in medium flame until this grounded paste turn as thick dough, add the cardamom powder,roasted moongdal and grated coconut,mix everything well and keep aside,let them cool completely..
Take a small ball from the dough and roll them with your fingers, arrange them over a greased plate and steam cook for 10minutes in Idly cooker..
Take the almonds,chironji seeds with enough water in a microwave safe bowl,cook for a minute in high power and keep aside..Grind the almonds,chironji seeds and chopped lychee with enough milk as a smooth paste..Meanwhile heat the milk with saffrons in a vessel and bring to boil,add the sugar,almond-chironji paste,cardamom powder and cook for few minutes..Allow it to cool,arrange in fridge atleast for 2 hours and serve it chilled .. 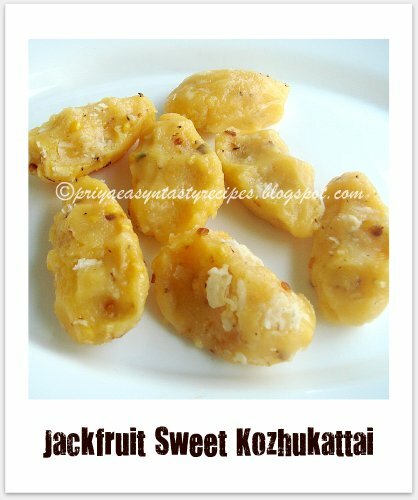 If you searching something new and completely different from our usual kozhukattais, give a trial to the wonderful looking jackfruit sweet dumplings, actually after trying this kind of sweet dumplings with Wheat flour and ragi flour, this year for Vinayaka chathurthi i wanted to make something different from my usual preparation, i tried these sweet dumplings today by grinding soaked rice and canned jackfruit chunks together with sugar which i cooked later in medium flame until they turned as a thick dough and prepared this dumplings along with roasted moongdal and freshly grated coconut..For my surprise this pidi kozhukattais tastes fabulous,quite addictive and completely new and different from the usual pidi kozhukattais..If you like jackfruits very much,you will definitely love this cute looking kozhukattais.. 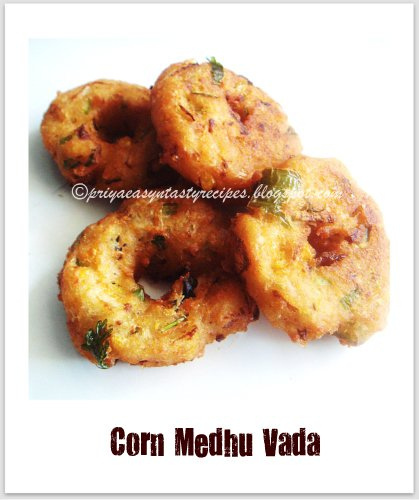 Grind the soaked rice, jackfruit chunks,sugar with enough water as fine paste..take this grounded paste with oil in a non stick pan, cook in medium flame until this grounded paste turn as thick dough, add the cardamom powder,roasted moongdal and grated coconut,mix everything well and keep aside..
Take a small ball from the dough and press with your fingers, arrange them over a greased plate and steam cook for 10minutes in Idly cooker..
My teddies love fresh fruit juices anytime of the day also i never stopped making them often.They are still having their summer vacations for one more week and needless to say they are trying to skip their breakfast quite often..Am trying to feed them either by preparing smoothies with fruits or else fresh juices for their brunch..Coming to this fresh fruits cocktail, i prepared this cocktail with varieties of fruit pieces and this fresh fruits cocktail tastes super delicious when served chilled also i skipped completely sugar and went for honey...They just enjoyed it a lot..
Pesto are prepared with herbs,cheese,olive oil and nuts, for a change i prepared this wonderful looking parsley walnut pesto as vegan version, yep i didnt used cheese in this green flavourful pesto..I used breadcrumbs,walnuts,olive oil,garlic and parsley leaves for making this quick and flavourful pesto..People whoever says no to cheese can try this vegan version of pesto, an excellent aromatic pesto to enjoy without any guilt..You can serve very well this vegan pesto with pastas,sliced boiled potatoes, toasted bread slices,tomatoes or else for making pizzas..This vegan pesto can stay prefect in refrigerator for a week or else you can freeze them very well for later use...A kid's friendly spread, yep my teddies couldnt stop themselves having this delicious pesto with some toasted bread slices..
Take the chopped parsley leaves,chopped walnuts,lemon juice,garlic cloves and bread crumbs in a mixie with enough salt and grind as a smooth paste..Serve with toasted bread slices,pastas or along with boiled potatoes..
Jhinge posto is quite a popular poppyseeds based ridgegourd curry traditionally prepared in Bengal either with a combination of potatoes or simply with prawns, my version goes just with ridgegourd which is called as Jhinge in Bengali..This flavourful dish goes for a poppyseeds and green chillies paste and cooked in mustard oil..Since ever i prepared making curries with mustard oil,i have completely got hooked to this flavourful oil and i could stop myself getting them from India..I prepared this easy breezy posto through microwave oven and this posto get ready very much quickly and we enjoyed having it with rice..Hope you guys would have enjoyed my 7 days of microwave cooking, this is our last day of blogging marathon, do check my other buddies running this 8th edition with me here..
Take enough mustard oil and mustard seeds in a microwave safe bowl,cook in high power for 2 minutes, add now the diced ridge gourd pieces,turmeric powder and salt,cook everything in high for 3 minutes, meanwhile grind the poppyseeds and green chillies as fine paste, add this grounded paste to hald cooked ridgegourd pieces,give a stir and cook for 5minutes(stir twice in between) until they get well cooked..
Preheat the oven to 350F,line a baking sheet,grease the baking sheet with enough oil and keep aside...Heat few drop of oil,saute the veggies,chopped green chillies until the veggies get half cooked..Meanwhile take the corn paste,cooked and mashed chickpeas,mashed potatoes,cooked mixed veggies,squeezed bread slices,garam masala powder,salt and chopped coriander leaves,mix everything well.. 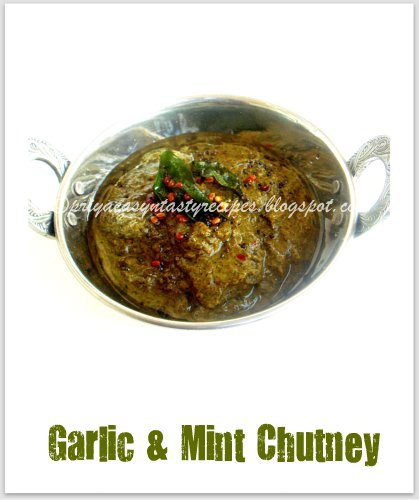 Serve hot with tomato ketchup or mint chutney.. 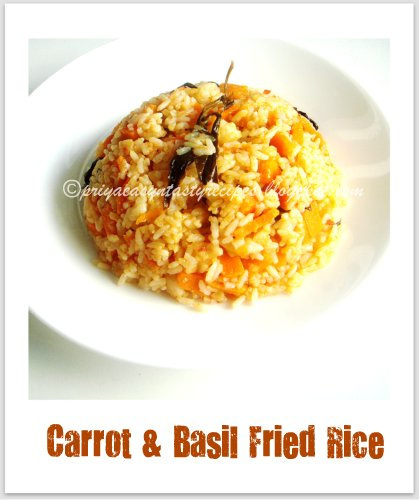 If you are supposed to make a simple and quick rice for a lunch or for a lunch box menu, this simple wonderful looking rice suits prefectly for you..This rice doesnt need onions,tomatoes,ginger garlic paste or any other special spice powder..I just spiced this rice with cumin seeds;green chillies and garam masala powder, a quick rice which i prepared through microwave oven..Serve this rice with some paneer based gravies, am damn sure you will definitely have a fabulous lunch or dinner...This quick rice suits absolutely prefect even for a party menu..Needless to say that this rice tastes simply super delicious even if they are served along with some fried papads, a wonderful quick dish suits super prefect even for a bachelor to make this simple rice very much quickly at home..Check out other blogger friends running this 8th edition of BM with me here..
Wash and soak the rice in 4cups of water for 10minutes, take enough oil,cumin seeds in a microwave safe bowl, heat everything in high power for 2minutes, add the sweet corn kernels,slit opened green chillies and garam masala, cook again everything for 2minutes in high, add the chopped green capsicum pieces and cook everything in high again for a minute, add the soaked water to the veggies with enough salt, cook in high power for 3minutes, finally add the soaked rice to the veggies,give a stir and cook for 5-6minutes in high power until the rice get well cooked..Garnish the rice with chopped mint leaves..
Take the coriander seeds,garlic cloves,dry red chillies in a microwave safe bowl,heat for 3 minutes in high, add the roasted channadal,dry coconut to the spices and heat again for a minute in high,keep aside and let them cool..Arrange the curry leaves over a microwave safe plate and heat in high for 2minutes until they turns dry and crispy, repeat the same process with mint leaves and coriander leaves until they turn dry and crispy..Take everything in a mixie jar along with enough salt and grind as bit coarse powder..
Conserve in a air tightened box and enjoy with rice with papads or for stuffing veggies or else as podi idlies or dosas.. 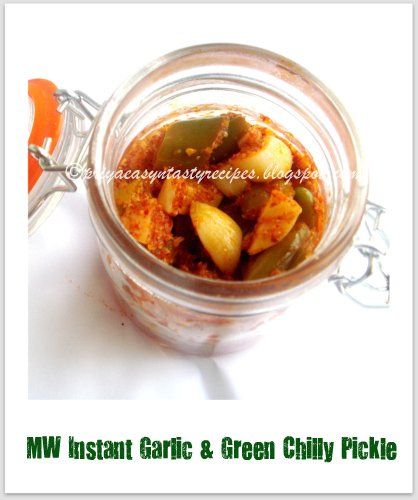 Instant pickles are always welcome at our home, whenever i feel like preparing some homemade instant pickles, i'll go immediately with the veggies or simply with garlic cloves, this time my small mind wanted to combine garlic cloves along with some large green chillies i got freshly from the farmer's market to make some instant pickle through microwave oven...Its took less than 20minutes in microwave oven and the final result was absolutely tremendous, a wonderful flavourful pickle which goes prefectly as side dish to serve along with rotis or simply with any sort of rice..To give the tanginess to this pickle, i went for amchur powder instead of vinegar..Quite a spicy and fingerlicking pickle to enjoy with anything, its stays prefect for more than a week if you conserve them properly..But believe me or not, we have already finished the whole bottle within three days..Do check other marathoners running this 8th edition of blogging marathon with me here..
Take the mustard seeds and fenugreek seeds in a microwave safe bowl, heat in high for 2 minutes until a nice aroma comes from the seeds,keep aside and let them cool..Grind as fine powder..
Take enough oil with mustard seeds for tempering,cook in high for 2minutes, add the garlic cloves,diced green chillies,cook everything for 5 minutes in high(give a stir in between), add the red chilly powder,amchur powder, mustard-fenugreek powder,salt, toss everything gently and cook for 5 minutes in high until the garlic & green chillies get well coated by the spice powder..Keep aside and let them cool completely..
Salna, a famous side dish usually served along with parotta in most of the roadside hotels, you can make varieties of salna with mixed veggies,meats or simply with eggs..Am sharing this delicious egg salna today which i tasted with parotta in a famous Pondicherry restaurant and tried them two days back here to serve along with parottas, i reproduce almost the exact same taste which we enjoyed in that famous restaurant, even my better half accept finally that this egg salna tastes exactly wat we had with parottas in India..You can serve this egg salna also as side dish for plain rice, briyanis or else with simple rotis. Heat few drops of oil,saute the onions,tomatoes,ginger,garlic,peppercorns,cumin seeds,fennel seeds,coriander seeds,green chilly and grated coconut for few minutes and grind as fine paste...Heat enough oil, add the curry leaves,fennel seeds and fry it..
Add the masala paste, turmeric powder, chilly powder,salt and cook everything in simmer for few minutes, finally add enough water,hard boiled eggs and cook until the salna gets slightly thick..Put off the stove and garnish the salna with chopped coriander leaves..
First thing i did once we came from our summer vacation was we went immediately to my routine farmer's market to get some fresh veggies,somehow i missed touching those fresh veggies in India, coz my MIL who was an expert in getting veggies by bargaining never allowed me to purchase veggies or fruits there..Its was quite hard for a foodie like me,anyhow the vendors in India change their prices whenever they saw us, even its happened in many shops..Personally July and august wasnt best to visit Pondicherry coz most of the pondicherrians living in France visit pondicherry during this month coz of summer vacation and everything seems to be costly at this time, we cant change some rules na..This weekend i got some fresh methi leaves from Indian groceries and finally prepared this delicious methi gobi through microwave oven for our yesterday's lunch..Its took less than twenty minutes to get ready in mw oven and we enjoyed this healthy methi gobi with curd rice, you can also serve it very well as side dish for rotis without any hesitation. 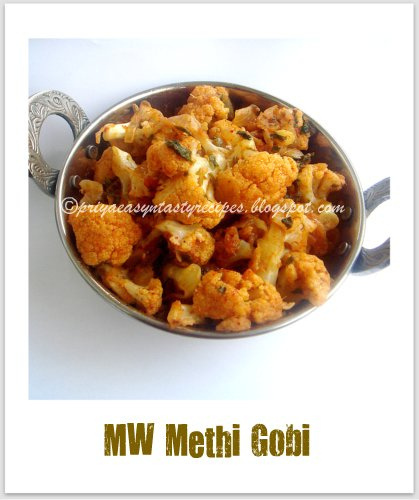 Take enough oil,whole spices in a microwave safe bowl, cook in high for 2 minutes, add the chopped onions,chopped tomatoes,ginger garlic paste,curry leaves and salt to the spices,cook everything for 4-5minutes in high (stir in between)..meanwhile chop the cauliflower as florets and soak in hot water..
Add the cauliflower florets,methi leaves to the cooked veggies along with red chilly powder,coriander powder,pav bhaji masala,garam masala powder, give a stir and cook in high for 5minutes (stir twice in between) until the veggies get well cooked.. 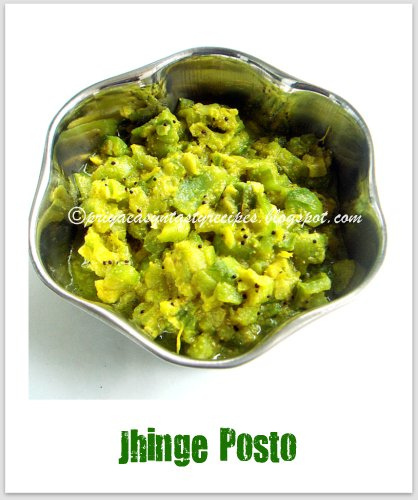 Serve hot as side dish for rice or rotis.. 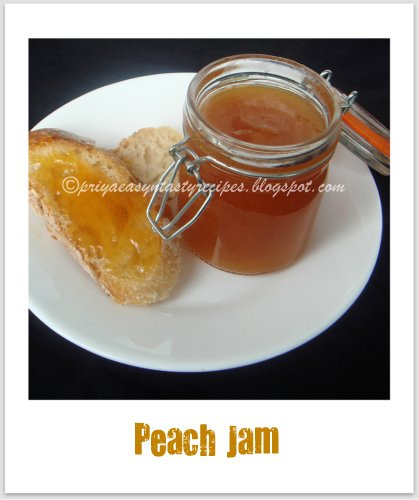 I love to prepare preserves and pickles anytime at home also i never stopped making them..Yesterday i prepared this delicious peach jam at home with my mini chefs..They peeled the skin of peaches,chopped them and helped a lot for stirring and all...They were very much proud of their first homemade jam and they enjoyed having with bread slices for their snacks and for their today's brunch...Delicious jam goes for quick preparation,it took half an hour for us to get ready,i didnt used any preservatives in this jam coz am avoiding those things in our foods..If you conserve this jam correctly,they can stay prefectly for a month in fridge.. 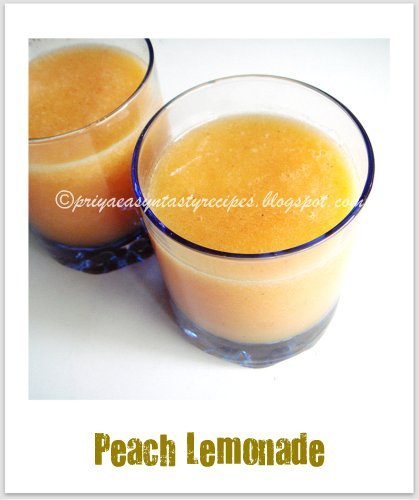 Blend the peaches as puree, take the peach puree, sugar together in a large pan and cook in medium flame until its gets thickens, add the lemon juice and cook for few minutes.. 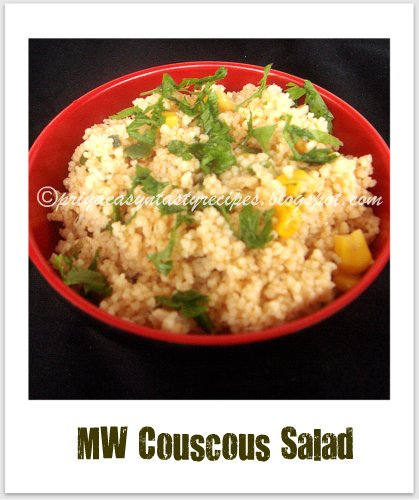 I can have salads even everyday or even anytime of the day..Sometimes its kinda hard for my family members to eat them, coz most of them love junk foods very much..But am trying to keep everyone away from those foods and just feeding them with fresh veggies and salads...Coming to this couscous salad, its takes only 5minutes to get ready, a wonderful salad to enjoy while its hot if they are served chilled or else serve them immediately with grilled meat or steamed veggies for a lunch or dinner, you have many choices to enjoy this filling salad with your choice of meats or veggies..Since am running blogging marathon, i choosed microwave oven for cooking couscous, you can very well make them in stove top..I have added few sweet corn kernels and finely cubed bellpepper to this salad and spiced up with vegetable stock,lemon juice,olive oil and salt, you can very well add many veggies of your choice for a colourful salad..Check my blogger buddies running this 8th edition of blogging marathon with me here..Pls dont bother for the picture,something went wrong in my camera,i couldnt able to fix it since yesterday,am trying to point out the fault hope i'll get my camera back to normal today. Take the couscous in a microwave safe bowl, add the vegetable stock,olive oil and salt, mix everything well and cook for 3-4 minutes high (stir twice in between),until the couscous grains get well cooked...Keep aside and let it cool completely..
Add the sweet corn kernels,cubed bellpeppers,chopped parsley leaves,lemon juice to the cooked couscous and toss everything gently...Keep in fridge for an hour before serving or serve immediately..
We always like banana and chocolate combination as shake anytime, since my teddies are still in vacation they skip sometimes their breakfast and i never stop combining or making shake with fruits for their brunch, one among those shake is this banana,pear and chocolate shake, seriously this combo rocks and everyone at home enjoyed having this incredible shake..Serve it chilled or with ice cubes, this shake tastes super fabulous,filling and satisfying, a wonderful drink to enjoy anytime of the day.. 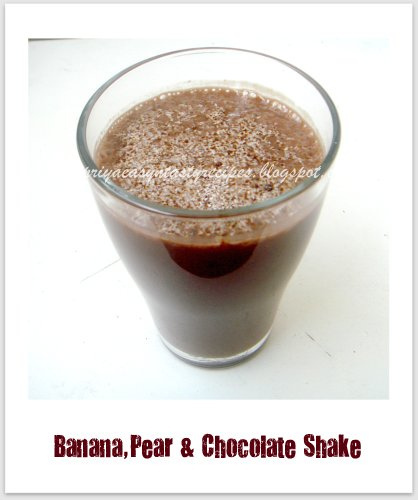 Blend everything in a blender as a thick shake, serve immediately or chilled..
Today am starting blogging marathon, thanks to Srivalli for accepting me to run again this wonderful virtual friendship chain which i couldnt able to run last month coz of my vacation to India, i had an opportunity to meet Srivalli, we had a wonderful blogger meet at Chennai while am travelling in India, seriously i met wonderful blogger friends and truly admire each and everyone for their friendly attitude, i enjoyed their foods personally and loved those beautiful moments with those wonderful ladies..Check out here other bloggers running this month's blogging marathon with me.. 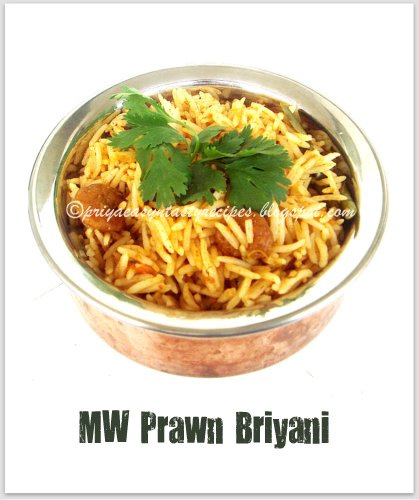 I prepare briyani rarely since we came back from India, yep we enjoyed varieties of briyanis there and none at home wanted to have them atleast before a month..This weekend i had an opportunity to get a bag of fresh prawns through a friend who came back from her summer vacation...Instead of making thokkus or gravies with those fresh prawns i prepared this delicious and flavourful briyani through microwave oven, whoever said no to briyani for a month,changed their mind and enjoyed thoroughly this mildly spiced fabulous briyani.. 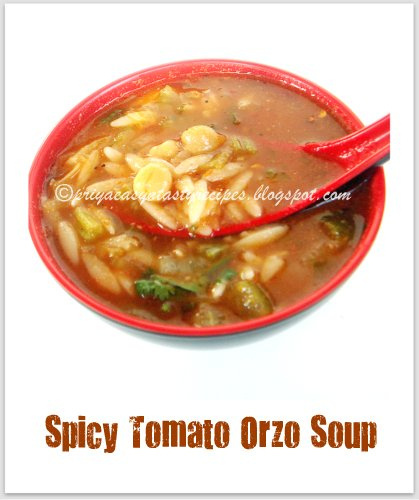 Most of our dinner goes for salads or soups, sunday's dinner soup is this quick,filling and spicy tomato soup with some orzo pasta..This soup tastes simply fabulous,filling also at the same time a wonderful satisfying dinner to enjoy without any hesitation with some toasted bread slices...Also i have added few chickpeas,celery to this soup to give more flavours,but i spiced up this soup with chilly flakes..Its our recent family favourite and am gonna make quite often this soup with orzo pasta in future..
Heat enough olive oil, add the chopped onions and saute for few minutes, add now the chopped celery,chopped parsley leaves,cook for few seconds, add now the tomato puree,vegetable stock,chilly flakes and salt,bring everything to boil,cook for few minutes in simmer..
Now add the orzo pasta,cook until they get partially cooked, add the cooked chickpeas to the cooking pasta,bring everything to boil and put off the stove.. 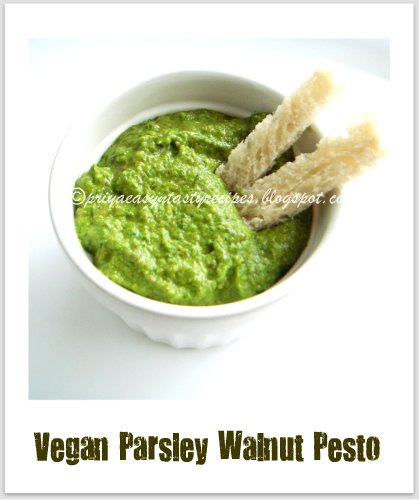 Serve hot with toasted bread slices.. 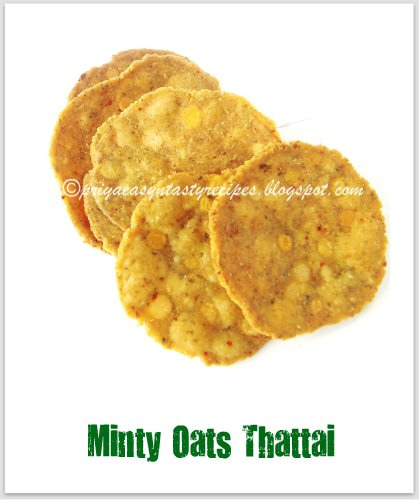 Seriously i was breaking my head to make some different savoury snacks for Krishna Jayanthi celebration,while going through my pantry i crossed a packet of rolled oats which was sitting quite a long to cook as something, finally i decided to make some thattais with oats, to give them more aroma i tried adding a handful of mint leaves which i grinded as coarse paste with fennel seeds,cumin seeds,garlic,peppercorns and dry red chillies..This thattai tastes super crispy with a wonderful mint flavour and we couldnt stop munching them for our snacks..Give a try friends, am damn sure you wont regret for trying this crispy beauties prepared with oats and mint leaves.. 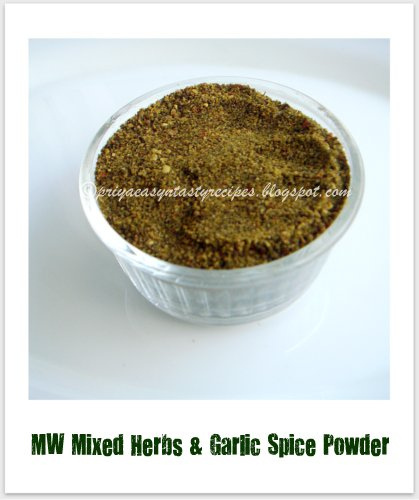 Grind the dry red chillies, fennel seeds, peppercorns, garlic cloves,cumin seeds and mint leaves as bit coarse powder..Take this grounded powder along with rice flour,oats flour, gram flour, roasted gram flour,butter,asafoetida powder,salt,soaked channa dal in a large vessel and knead a soft and stiff dough with enough water..
Heat oil for deepfrying, take a golf ball sized dough, line two greased baking sheet or ziplock bags in a poori press,arrange the dough between the baking sheets or ziplock bags, give a genlte press to flatten the dough..Drop this flattened thattais to the oil, fry until they turns golden brown, repeat the same process until the dough get finished.. 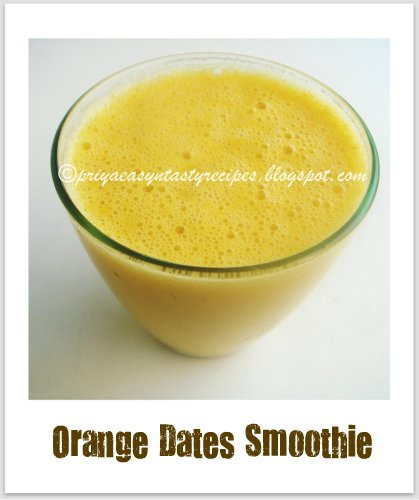 I dont need much to say anything about dates, most of us know that they are loaded with numerous health benefits..I never stopped having them atleast twice a week as any form, my fridge will always have seedless dates or dates sryup anytime...Recently i prepared this quick,satisfying smoothie by combining some seedless dates and orange slices for making this wonderful,refreshing smoothie..A fabulous drink to enjoy to kick start ur day either along with a bread slices for breakfast or simply for breakfast..I have added sugar in this smoothie, you can make this thick smoothie as sugarfree just by adding more dates or dates syrup..My teddies recent breakfast smoothie is this incredible thick filling smoothie. 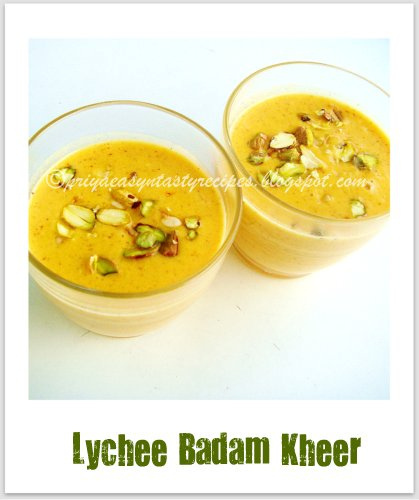 Soak the seedless dates in hot water for half an hour or else use Lion's dates syrup..Blend the orange pieces,soaked dates, sugar and yogurt as a thick smoothie,serve immediately with or without ice cubes..
A wonderful chutney suits prefectly to serve along with crispy dosas or soft idlies, i prepared this chutney simply by sauting mint leaves,garlic along with coriander seeds,dry red chillies and tamarind and grinded as this flavourful chutney,for my surprise this green chutney tastes super delicious,spicy and flavourful..We enjoyed having this chutney with some crispy dosas for our dinner and we relished it..Definitely a quick chutney tastes simply delicious also needless to say the health benefits of mint leaves and garlic cloves, personally i felt its quite a best way to sneak garlic cloves by making this sort of simple and quick chutneys..
Heat few drops of oil, roast the coriander seeds,dry red chillies,tamarind until they get well roasted,keep aside..Sauté the garlic cloves until they turn brown and add the mint leaves to the garlic cloves and stir until they shrinks.. Grind the roasted spices,garlic cloves,mint leaves along with salt and enough water in a mixie as a bit coarse paste,meanwhile heat enough oil,let splutters the mustard seeds,urad dal and curry leaves, add this tempered spices to the grounded chutney and enjoy as side dish with dosas or idlis..
During our vacation in India, my teddies enjoyed a lot mini idlis soaked in flavourful sambar, they got hooked completely to those irresistible cute sambar mini idlis..I didnt forget to pick a mini idli stand while doing our shopping without any fail..Mini idlis rocks! 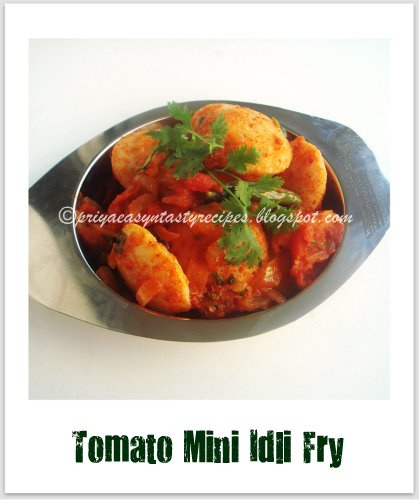 my younger son who says no always to idlis is just enjoying mini idlis with anything..Our yesterday's dinner was this irresistible tomato mini idli fry with some leftover mini idlis...Its quite a delicious,quick and easy idli fry to serve either for breakfast or for lunch, this tomato idli fry doesnt need any side dish and gets vanished very much quickly once you serve them hot..A wonderful filling dish to enjoy without any hesitation, you can very well carry them for our lunch also..
Heat enough oil, fry the whole spices,fennel seeds..Add immediately the chopped onions,ginger garlic paste and chopped tomatoes with enough salt and saute until the veggies get well cooked, add the garam masala powder, red chilly powder, slit opened green chillies,curry leaves and cook everything for few minutes..
Now add the leftover mini idlis to the cooking masala,toss gently everything..add the chopped coriander leaves and cook for few minutes in simmer...Serve hot. 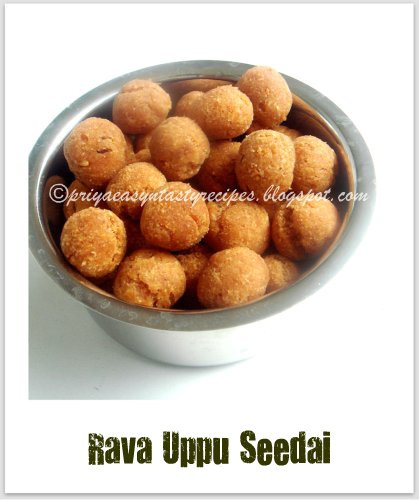 If you want to try out different crispy uppu seedais for Krishna Jayanthi celebration, you have to give a trial to this crunchy munchy rava uppu seedai..Usually we used to make seedais with rice flour and urad dal, here in this rava seedai you can very well skip the urad dal completely and rava will give a fabulous crunchy texture to this seedais, definitely a real twist to our usual seedais..Take care not to fry the rolled balls immediately,leave them for half an hour in room temperature and fry them in hot oil, your seedais wont explose and they will definitely turn super crispy..You need loads of patience for making this tiny crispy beauties to get a better final result..Give a try friends..
Take the sieved rice flour,fine roasted rava,salt,butter in a bowl, mix everything well with a fingers until they turns crumble like texture,add the sesame seeds,cumin seeds,give a mix..Now slowly sprinkle water and turn as a soft and stiff dough..Keep aside for half an hour.. Roll out tiny balls from the dough (if your dough is prefect,you doesnt even need oil for rolling),arrange the rolled tiny balls over a paper towel and keep aside for half an hour before frying..
Heat oil for deepfrying, drop gently enough balls and fry until they turns golden brown,fry them in small batches,drain the excess of oil in a paper towel..Arrange in an air tightened box and enjoy..
Its been a long i baked crumble at home, this time i prepared a delicious peach crumble using oats and almond powder as the crumble mixture..Its quite an easy breezy crumble which gets ready quickly and also vanish very much quickly, serve it with a scoop of vanilla or chocolate icecream, whoever says no to fruit based bakes will definitely enjoy this fabulous peach oats crumble..It was our weekend snacks, my mini chefs joined their hands to prepare this super delicious peach crumble and enjoyed thoroughly with a scoop of chocolate icecream for their snacks. 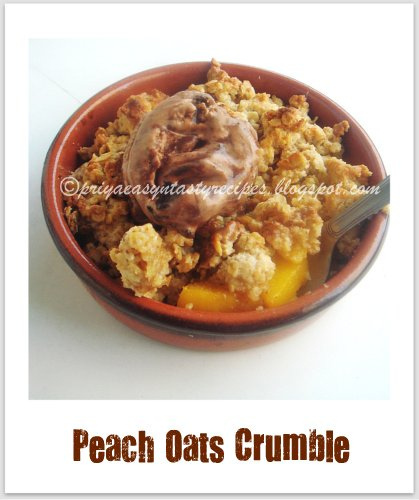 Preheat the oven to 350F..Chop the peeled peaches as small pieces, add the lemon juice, sugar and cinnamon powder,mix well, take this mixture in a ramekins..Meanwhile take the flour, oats given for crumble in a bowl, add the butter and turn as breadcrumbs like mixture with ur fingers, finally add the remaining sugar and almond powder, give a mix...Spoon the crumble over the peaches and press them lightly..bake the crumble in middle rack for 30minutes until the crumble turns golden brown..
Green Lady is a refreshing summer drink, prepared with khus syrup made from the essence aka khus extract well known as vetriver is a Ayurvedic cooler..This khus syrup is prepared by using this khus extract and sugar syrup helps to keep the body cool,specially during the hot summer..Green lady is a excellent drink prepared using khus sharbat,lemonade,lemon juice, salt and ice cubes, for a change i have added few basil seeds...I came across this drink at chef Sanjeev Kapoor 's Space before leaving to India and i didnt forget to buy this famous khus syrup while doing my shopping in India..Yesterday, here the climate was bit hot and prepared this wonderful drink, even my teddies enjoyed this catchy green refreshing drink..A fabulous thristy quencher to enjoy without any guilt while its hot.. 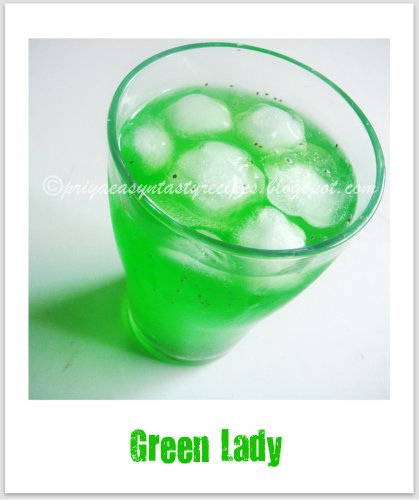 Mix together the khus syrup,salt,lemon juice,stir well..now add the icecubes, lemonade,soaked basil seeds and stir..Serve chilled with a slice of lemon.. 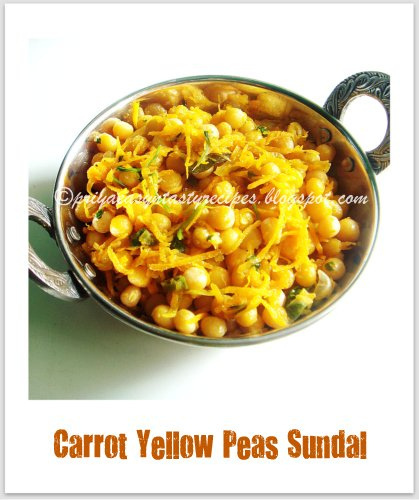 Kids are still in summer vacation here, sometimes i have to break my head to feed them especially for evening snacks..Today for our evening snacks, i prepared this super delicious,mildly sweet sundal using grated carrots and yellow peas, this sundal was quite filling,satisfying,nutritious also at the same time anything with yellow peas are my teddies favourite, just to change the usual way of making sundal i have added few grated carrots in this sundal to feed easily my teddies..You can very well add any sort of veggies in this sundal, quite an easy and brilliant way to feed our teddies in case they dont like veggies..You can also serve this sundal as side dish for rotis..Needless to say we enjoyed having this delicious protein rich sundal for our snacks, just loved it. 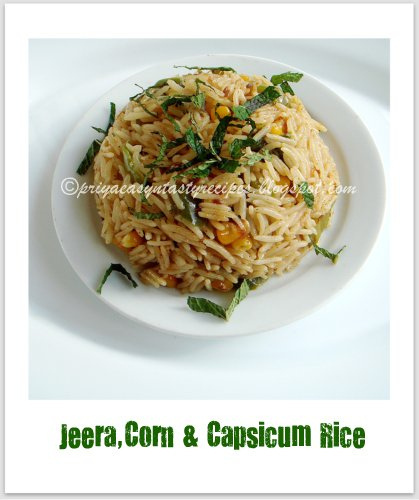 Heat enough oil,let splutters mustard seeds, urad dal, add immediately the asafoetida powder, fennel seed powder, fry for few seconds, now add the chopped onions, grated ginger, curry leaves,crushed garlic,chopped green chillies, stir until the onions turns transculent, add the grated carrots and salt,cook for few minutes, finally add the garam masala powder,cooked yellow peas and chopped coriander leaves,give a stir and put the flame in simmer and cook for few minutes.. 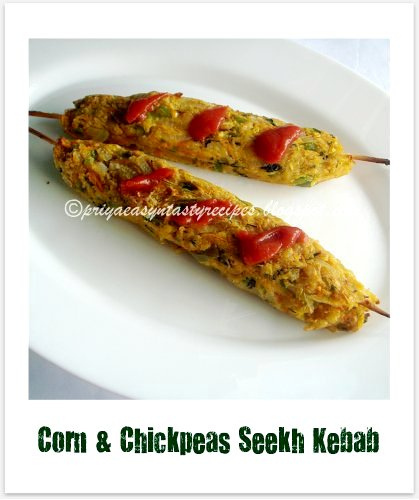 Enjoy for snacks or as side dish.. 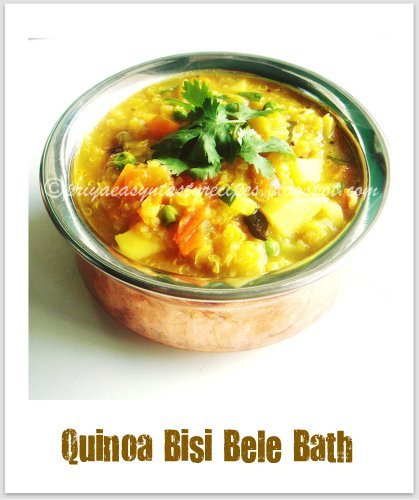 If you are a die hard fan of BBB aka Bisi bele bath, you will definitely love this super healthy quinoa bisi bele bath..Serve it warm with some potato chips, whoever says no to quinoa will definitely finish the whole plate in few minutes, with loads of colourful veggies and toor dal this BBB tastes simply delicious, a comforting food for peoples like me..Quinoa in bisi bele bath gives a fabulous nutty flavour which was quite filling when served either for lunch or for dinner, a wonderful dish for people who are willing to skip rice in menu..After trying out BBB with Bulgur & Broken Wheat, i couldnt stop myself to make some BBB with one of my favourite grains,the famous Quinoa..Everyone at home loved this complete one pot meal and enjoyed a lot with potato chips, prefect side dish to serve along with this BBB..
Wash the quinoa and dal together and keep aside...Heat enough oil in a pressure cooker,add the bayleaves,dry red chillies, curry leaves,fry them... now add the chopped onions,chopped tomatoes,cook until the onions turns transculent and tomatoes turns mushy,immediately add the veggies,salt and sauté for few miutes..now add the tamarind extract,bisi bele bath spice powder, a cup of water, cook everything for few minutes..
Stir in the washed quinoa and dal to the cooking veggies,finally add 5 cups of water,close the pressure cooker and cook for upto 2 whistles,add the chopped coriander leaves to the bisi bele bath,give a stir..Bisi bele bath should be watery,but once cooled they will turn thick.. 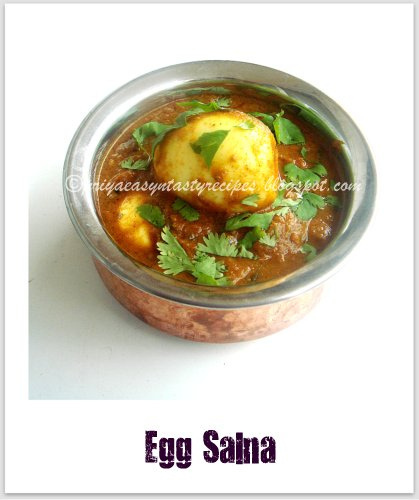 Enjoy BBB with chips,fryums or papads.. 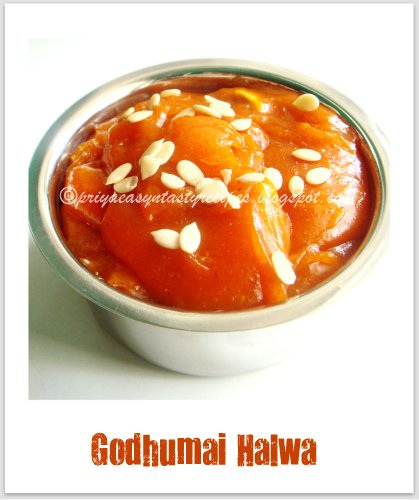 Since a week, am trying to come back to routine eventhough its kinda hard for me that why i couldnt able to post my recipes quite frequently since few days, am yet to get rid of the laziness..I have completely forgotten about this month's Indian Cooking Challenge, thats the reason am posting my post bit lately eventhough i have prepared this fabulous halwa during this weekend..Seriously i have a bunch of halwa lovers at home, even after finishing few kgs of halwa while travelling in India, my sweet tooth was seriously craving for some sweets, fortunately this month's Indian cooking challenge was this authentic Tirunelveli halwa ,which pulled me immediately to give a try.. Even this halwa goes for a long process, its quite worth to try and my H didnt stop enjoying this glossy delicious halwa..Thanks to Srivalli for choosing this fabulous halwa,we truly enjoyed it..She shared four links for this godhuma halwa to try but my choice went to Lathamma's Wheat Halwa which sounds super prefect for me but used more ghee and sugar to satisfy our tastebuds ..
Soak the wheat berries for a day (change the water atleast twice in between)..grind it in a blender with enough water and strain the grounded paste and squeeze out the milk from the grounded berries and filter the liquid..Repeat the process by blending the wheat berries with enough water and discard the grounded berries after extracting well the milk..
Pour the wheat milk in a thick bottomed pan, add the sugar and cook on low flame stirring continously..Add the ghee little by little once the halwa starts thickening,finally add the cardamom powder,cashew nuts and orange food colour dissolved in milk, mix well..Cook until the halwa gets off the vessel..Serve either in a bowl topped with some melon seeds or spread on a greased plate and cut as desired shape..
After coriander and mint leaves, my most favourite herb is basil leaves, i never stopped buying them and never stopped adding them in my cooking especially while making pastas, love basil leaves pesto as well as in pizzas..But this time i prepared a quick,easy and simply delicious fried rice using basil leaves and carrots, an incredible main course to carry even as a lunch box menu or to serve as party menu dish..This fried rice goes for a quick preparation and its gets ready in less time..You can use very well leftover rice for making this quick fried rice, basil leaves in this fried rice gives a distinct flavour while carrot gives a mild sweetness to this spicy fried rice, my teddies enjoyed this delicious fried rice with simple omelette..You can very well add chicken chunks or shrimps or else more veggies to this fried rice, anyhow we loved this carrot and basil leaves combo..
Heat enough oil, saute the chopped onions, basil leaves together until the onions turns transculent, add immediately the carrots with ketchup,soyasauce,chilly paste,vinegar and salt,saute everything in simmer until the veggies get half cooked (since i love crunchy carrots i didnt cooked them well, if u need them well cooked,cook them for few more minutes)..
Now add the cooked rice, toss everything gently until the veggies and rice gets well mixed, serve hot with meats or simply with an egg omelette.. Somehow i missed summer fruits while i was travelling in India, fortunately it wasnt late to enjoy them rite now here..I picked few fresh and juicy peaches yesterday from farmer's market, after making some upside down cake, there were some leftover chopped peaches which i turned as this quick,refreshing drink qlong with lemon juice as lemonade, this lemonade tastes fabulous,definitely a thristy quencher...We loved this lemonade chilled eventhough the Paris climate was quite cloudy and bit rainy, yep we dont bother to have this drink even its not too hot here...A prefect drink to enjoy while its hot. 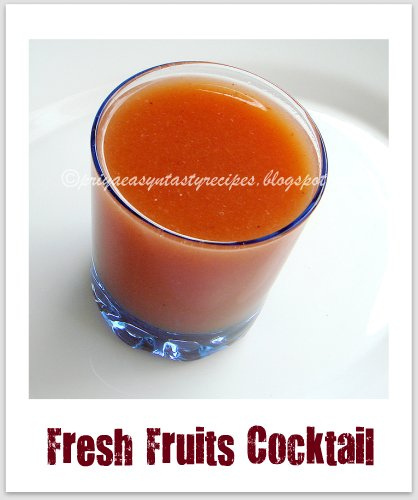 Bring boil the sugar,water and peaches, put off the stove and let them cool completely..Mash the cooked peaches and strain the juice, add finally the lemon juice and stir well..Serve chilled or with ice cubes.. 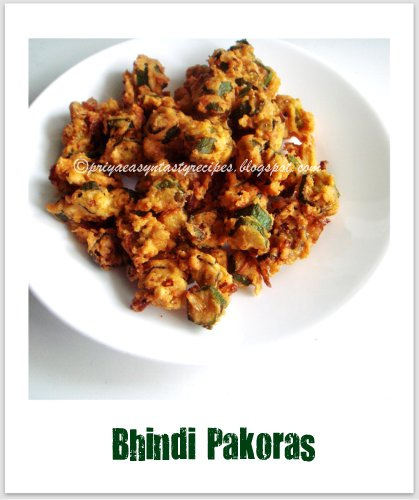 If you dont have enough bhindi aka ladies fingers, the famous protein rich veggies for making curries or any sort of gravies with them,dont forget to turn them as these crispy beauties..Whoever says no to bhindis wont stop munching this addicitive crispy pakodas..Its our recent favourite which suits prefectly to enjoy along with a cup of tea or coffee for our snacks or simply as an appetiziers also at the same time as a side dish for any sort of rice dishes..Its a real feast for bhindi lovers like me, am damn sure that if you prepare this pakodas at home you can stop yourself munching them..Yep they are quite addictive and comforting for the sure..
Take the chopped bhindis,chopped onions,curry leaves along with rice flour,gram flour,chilly powder, ginger garlic paste,fennel seed powder and salt in a large bowl, sprinkle enough water and mix everything well until the veggies gets well coated with the flour paste, meanwhile heat oil for deep frying..
Drop gently enough flour coated bhindi pieces and fry until they turns golden brown,drain the excess of oil with a paper towel..Enjoy with a cup of tea for snacks or serve as an appetiziers.. 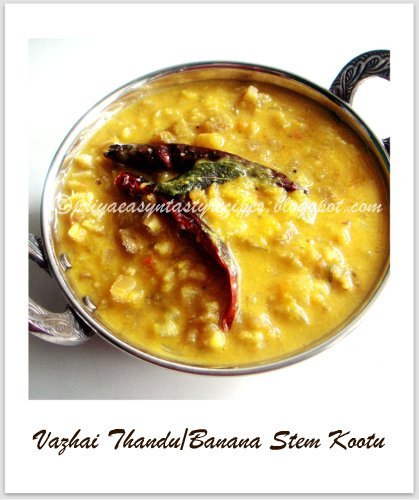 I couldnt stop myself to get some fresh and rare veggies from India, one among those is this banana stem..Eventhough my MIL prepared many curries with this banana stem,my favourite goes always to my version of kootu..Today for our lunch i prepared this quick and nutritious kootu with moongdal and with a grounded masala paste with coconut,cumin,coriander seeds and dry red chillies..Enjoyed having this wonderful,healthy and delicious kootu with rice and papads..Needless to say how healthy these banana stems are, even i had the famous juice with this banana stem during our vacation in India, a must to drink if you go to India..
Roast and grind all the ingredients given under the list 'to roast &amp;amp; grind' as fine powder, meanwhile pressure cook the moongdal,chopped banana stem with turmeric powder and salt with enough water upto 3 hisses...keep aside until the steam gets released. Heat enough oil, lets splutters the mustard seeds,urad dal,asafoetida powder, fry the red chillies until brown, now add the chopped onions,chopped tomatoes,curry leaves and saute until the onions turns transculent...Add the cooked dal-banana stem mixture,already prepared spice powder to the onions,cook everything for few minutes,put off the stove..
Am back friends, after a month break its a real pleasure to post a fabulous crispy snacks which i prepared before leaving to India...We had a fabulous vacation in India,enjoyed many wonderful yummy dishes even we had a excellent Haleem at Hyderabad..We couldnt stop buying and enjoying many street foods, we just loved it..Coming to this medhu vada, i prepared a batter using sweet corn and urad dal for making this wonderful looking crispy medhu vadas,serve it with spicy coconut chutney you will definitely love this mildly sweet vadas...We loved this vadas as rasa vadas, soak these vadas for few minutes in tangy tomato rasam, you will definitely love this fantastic vadas..This vadas can be prepared either as dahi vadas or else as sambar vadas,you have numerous choices to enjoy this incredible vadas..
Soak the urad dal for an hour before grinding, grind both urad dal and sweet corns without water,add the salt to the urad dal and sweet corn mixture,this help the dals to grind together well, now add the chopped onions, chopped green chillies, chopped ginger pieces, chopped curry leaves,crushed fennel seeds and chopped coriander leaves..mix everything well with your fingers..
Heat oil for deepfrying, take a small ball from the corn medhu vada batter, flatten them with ur fingers, drop gently one by one to the hot oil..deep fry the vadas until they turn brown, fry everything as small batches, drain the excess of oil with a paper towel..